Having the best rear view dash cam installed in your vehicle is one of the smartest things that you can do. Driving is unpredictable, and regardless if you’re the best driver in the world, there are still other people on the road. It’s always necessary to take into consideration the other factors when driving and protecting yourself in the unfortunate case of an accident. For ten years, Auto-Vox has made their mark on the automotive industry with their leading mirror, rear view, and front view cameras. Even after being featured in multiple trade shows and sold in various big box retailers, Auto-Vox continues to strive to develop more innovative and user-friendly vehicle cameras that help to protect their customers. The Auto-Vox X2 Mirror Dash Cam is just one of the many that we were able to review, and we’re excited to share our results. 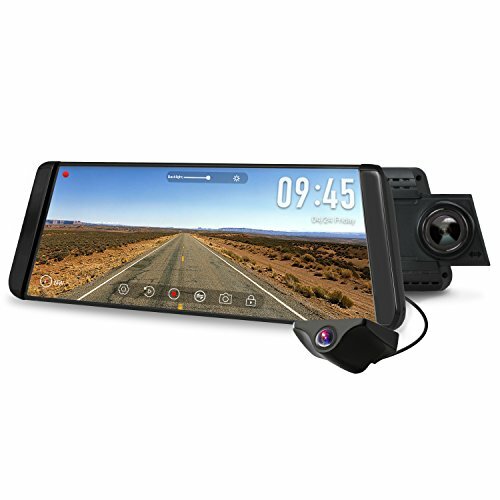 The Auto-Vox X2 Mirror Dash Cam features a 9.88-inch touchscreen mirror that provides you with realistically bright colors and a clear view of traffic. The X2 model fits perfectly over your rearview mirror and gives you a double image through the rearview camera. The camera turns on automatically as you shift into reverse, and has a full, 140-degree angle view that provides ample viewing of your blind spots. The G-Sensor installed ensures that your footage is saved and locked into place in case of sudden braking or a collision. On the other hand, the loop recording feature makes sure your camera overwrites unneeded media. It saves much-needed space on your memory card, so you don’t need to purchase multiple or worry about exchanging them as they fill up. The included parking feature starts to record if any type of impact against your vehicle is detected, and the camera also features a lane departure warning. Thinkware is one of the world’s leading dash camera brands. Since 1997, they have been going strong and developing reliable, innovative products that spread throughout 800 cities worldwide. While their demographic ranges, Thinkware continues to ensure that they provide products that keep their customers safe, happy, and comfortable with leading technology that has brought the award-winning company recognition. 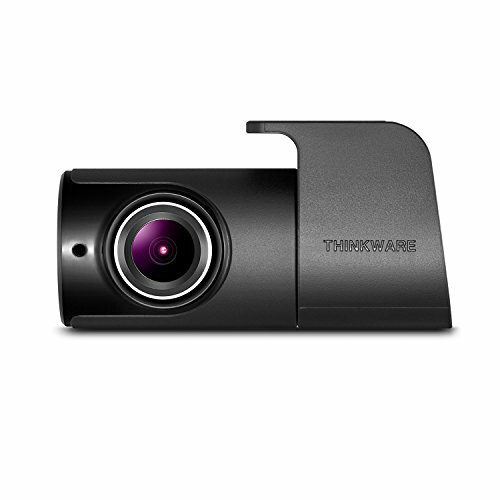 The Thinkware Rear View Camera is compatible with their extremely popular X500, X550, and F750 dash cameras. It has a one-year manufacturer’s warranty and is a 1080p camera that’s equipped with the world-renown Sony Exmore CMOS Sensor software. It also includes a 140-degree wide viewing angle that ensures even your rear blind spots are visible. The rear view camera can be hardwired to the main unit, enabling it to detect impact and motion when programmed to run in parking mode. The included connecting cable is an impressive 21 feet, which makes it easier to hard wire to a battery pack, so you don’t worry about draining your battery by plugging it into your cigarette lighter for extended periods. The Autolover brand distributes its line of cameras all over the world and is sold in large retailers with positive feedback. They have proven that with hard work and dedication, the brand and products that you offer to the world get noticed. Autolover continues to grow their name by designing and manufacturing unique and innovative dash cameras that deserve to be reviewed and talked about. The Autolover E5 Mirror Dash Cam is third on our review list, so we can let you know how the dash cam performs, and whether or not it’s the best rear view dash cam. The Autolover E5 Mirror Dash Cam features both front and rear simultaneous recording. The cameras perform in both day and night conditions, and the rear camera is waterproof and provides a 170-degree wide angle view. The mirror cam features a five-inch blue screen with an anti-dazzle performance that offers an increase in safety when driving at night. There is a built-in gravity sensor that boosts the cam’s action in cases of a collision and ensures that at least ten seconds from both the front and the back are recorded and locked. The loop recording feature overwrites unneeded files that aren’t locked, so your camera can continue to record even when the memory card is full. Additionally, the mirror features a picture-in-picture-out display. Depending on your preferences, you can switch the image between three modes. You can choose to have the rear display on all the time, or just when your vehicle is in reverse. We found interesting results when reviewing and comparing the three models of rear dash cameras that we chose. While each of them has their individual pros and cons, we wanted to make a decision that we felt was right for you. We looked at special features, performance, recording time, ease-of-use, and price when determining our choice. We concluded that the Autolover E5 Mirror Dash Cam is the best rear view dash cam. Not only does it have dual performances, but the waterproof rear camera and anti-dazzling feature on the mirror were too good to look past. Additionally, the camera is exceptionally affordable when comparing it against other models. The rear view camera might not record in 1080p like the dash cam, but it has excellent clarity that ensures you can see everything you need to look at in the case of a collision, and it works at night. 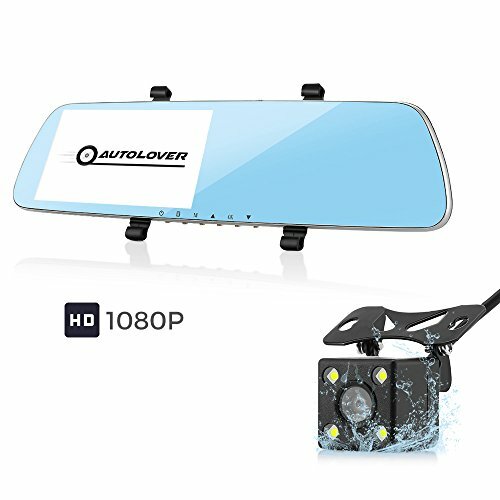 We are comfortable knowing that if you purchase the Autolover E5 Mirror Dash Cam, you’re going to get everything you need.